For a long time, insurance companies have been afraid of implementing AI-based solutions in customer service. They claimed that their customers aren’t interested in online contact. However, the evolution of consumer behavior and the entry of insurtech companies into the market resulted in a change of attitude. Personalization and speed define customers’ purchase decisions and Virtual Insurance Agents can provide them with support throughout their experience. Buying the right insurance is a big challenge today. The numerous options and different packages raise countless questions from the consumer’s about the best choice. Digitalization of services has created new tools or purchased from the application or website. According to the McKinsey & Company report, the role of insurance agents will change dramatically by 2030. The number of agents will decrease significantly as active agents retire and the rest rely on technologies that increase productivity. 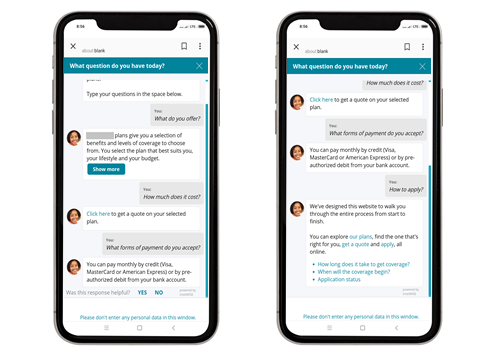 The agent of the future can sell almost any type of policy and will also help customers manage their insurance based on different experiences, health issues, mobility or residential property. Agents use intelligent personal assistants to optimize their tasks, as well as AI-based solutions to find potential offers for their clients. These tools makes customer interactions shorter and can tailor the offer to the exact current and future needs of each individual client. Intelligent technologies have become extremely important both for the insured and insurer, for whom they are an opportunity to efficiently offer communication and for distinguishing themselves from the competition. Customers, especially young ones, are aware of the diversity of choices they possess and have many questions before making a decision on taking out a policy. Until recently, companies had to invest in a complex Call Center; the wider their offer, the higher the employment rate of consultants. Repeated questions concerning the pricing of the policy, its content or exclusions burden the helpline, where the volume of such inquiries could reach tens of thousands of daily issues. Call Center agents handle a wide variety of repeated queries both in matters of policies and the claim filing process. It can generate costs reaching millions of dollars a year. Insurance companies have to hire many consultants with appropriate qualifications which is expensive. It may also cause frustration among clients, who are forced to wait for a telephone connection with an advisor or information sent via e-mail. Intelligent technologies based on artificial intelligence algorithms support insurers in customer service. 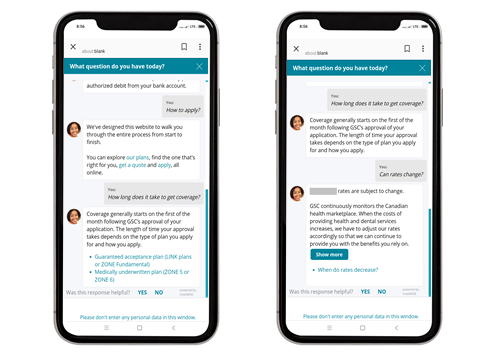 InteliWISE’s Chatbot, implemented for one of the leading insurers in Canada, answers user questions about health insurance. InteliWISE has been working with leading global insurers for several years, so far we have focused on intelligent automation to help customers solve their most common problems. However, today also the choice of policy and searching for answers on insurance coverage issues can be supported by the Virtual Agent, just as in the case of our client in Canada. Screen 1. Chatbot Jessica suggests several conversation topics by default. After selecting an offer, the user can check available plans. Screen 2. Chatbot will also dispel client’s doubts about costs and payment methods. Jessica will guide you through the application process for the selected health insurance package. Screen 3. The Virtual Agent will also answer questions about deadlines and contributions. 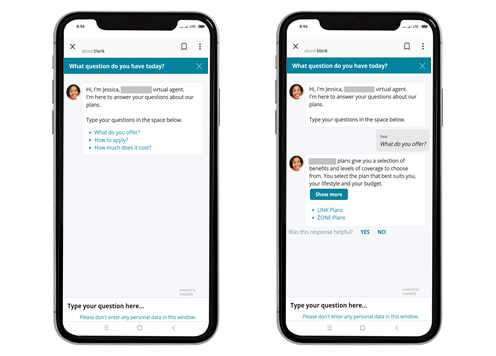 Chatbot can provide information on issues such as the cost of insurance plans, travel insurance plans, the procedure for concluding an insurance policy or applying for insurance payments. The Virtual Agent captures the user’s intentions and, through linear scenarios, leads client step-by-step to obtain all the needed information on a given subject. Digital innovations allow to tailor insurance offer to the customer’s preferences. They are practical for all parties. That’s why we expect that Chatbots will also be the future of insurance sector.